We wish to draw your attention to the Large Scale Projects program for observations with the Submillimeter Array (SMA), which is now accepting Notices of Intent to propose. Under this program, proposals dedicated to answering major astrophysical questions having significant scientific impact requiring observing times of order 100-1000 hours are solicited. In this communication, we are also pre-announcing the dates for standard observing proposals. These calls are for the 2018B semester with observing period Nov 16, 2018 - May 15, 2019. The SMA is a reconfigurable interferometric array of eight 6-m antennas on Maunakea jointly built and operated by the Smithsonian Astrophysical Observatory and the Academia Sinica Institute of Astronomy and Astrophysics. The array operates in the 230, 345 and 400 GHz bands. The SMA has recently completed significant upgrades in observational capability, with more under way. Currently, the SMA observes simultaneously with two orthogonally polarized receivers, one in the 230 GHz or 345 GHz band and the other in the 240 GHz or 400 GHz band (with full polarimetric observations available using the 230+240 or 345+400 band combinations). The SWARM correlator processes 8 GHz bandwidth for each receiver in each sideband, for a total of 32 GHz, at a uniform 140 kHz resolution. This 32 GHz frequency coverage can be continuous where the tuning ranges overlap for the two orthogonally polarized receivers. In short, the SMA now provides flexible, wide band frequency coverage that delivers high continuum sensitivity and excellent spectral line capabilities. A full track offers continuum sensitivity of 200 or 500 micro-Jy (1 sigma) at 230 or 345 GHz in good weather conditions (precipitable water vapor 2.5mm and 1.0mm, respectively). The corresponding line sensitivities at 1 km/s resolution are 30 and 70 mJy. The small antennas allow access to low spatial frequencies in the sub-compact configuration, and at the other extreme, the finest angular resolution with the very extended configuration at 345 GHz is ~ 0.25". The compact and extended configurations complete the range. Thus, in some ways, the characteristics and performance of the SMA are both similar and complementary to those of the stand-alone Atacama Compact Array (ACA) component of ALMA. For more information about SMA capabilities, visit the SMA Observer Center website and explore the set of SMA proposing tools. Current and archived SMA Newsletters available online provide a sampling of the wide variety of science possible with the SMA. A second announcement will be circulated when the standard proposal system opens for submissions. Questions or comments regarding the Call for Large Scale Proposals can be addressed to sma-largescale@cfa.harvard.edu and on standard proposals to sma-proposal@cfa.harvard.edu. It is my pleasure to announce that Associated Universities, Inc. (AUI), and the NRAO have awarded the 2018 Karl G. Jansky Lectureship to Professor Roger D. Blandford of Stanford University. The Jansky Lectureship is an honor established by the trustees of AUI to recognize outstanding contributions to the advancement of radio astronomy. Blandford has a long association with NRAO and the broader astronomy community, is an outstanding scientist and communicator, and has made many theoretical contributions to radio astronomy. In particular, he and his colleagues developed the basic theory behind the formation and propagation of cosmic jets of plasma propelled at nearly the speed of light. He has received many prizes and awards and is arguably the outstanding theoretical astrophysicist in the U.S.
A native of England, Blandford earned his B.A., M.A., and Ph.D. degrees at Cambridge University. He held postdoctoral positions at Cambridge, Princeton, and Berkeley before joining the faculty at Caltech, where he taught astronomy and physics for 25+ years. In 2003, he moved to Stanford to become the first Director of the Kavli Institute for Particle Astrophysics and Cosmology. His research interests cover many aspects of radio astronomy involving quasars, pulsars and supernova remnants, as well as cosmology using gravitational lensing and the cosmic microwave background. 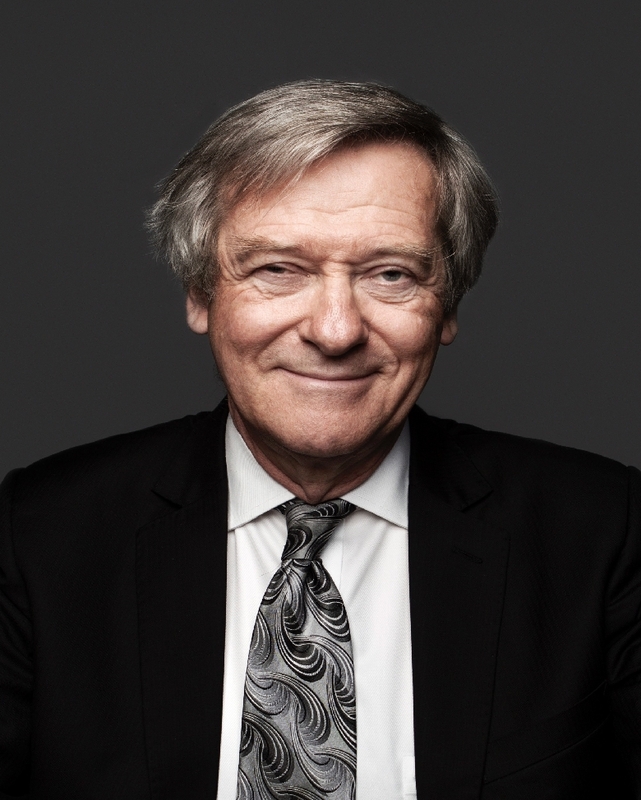 Blandford has received many honors, including election as a Fellow of the Royal Society and of the American Academy of Arts and Sciences, and is a member of the National Academy of Sciences. He has received the American Astronomical Society's Dannie Heineman Prize, the Crafoord Prize, and the Gold Medal of the Royal Astronomical Society. As Jansky Lecturer, Blandford will speak in the fall at NRAO facilities in Charlottesville, Virginia; Socorro, New Mexico; and at the Green Bank Observatory in West Virginia. These lectures are open to the public. The ngVLA science case volume is a major deliverable to the Astronomy 2020 Decadal Survey. This volume is being crafted by the ngVLA Science Advisory Council, in consultation with the community at large, and the ngVLA Project Scientist. The volume will be published in the Astronomical Society of the Pacific monograph series and will be an extremely useful summary of the ngVLA Key Science Mission for Astro 2020 panel members, as well as demonstrate the Project's firm handle on the associated technology requirements and cost. We are in the process of reviewing submitted content and will have a first draft by the June Astrophysical Frontiers meeting. We will continue to accept contributions through the summer. The final book will be published by December. Instructions for submitting chapters can be found online. This ambitious conference will bring together a large cross-section of the multi-wavelength astronomical community to discuss the most pressing astrophysical questions in the near-future. This conference will consist of plenary sessions of invited speakers and parallel sessions of invited and contributed presentations covering Origins of Exoplanets and Protoplanetary Disks; Mechanisms of Galaxy Evolution; and Black Holes and Transient Phenomena. While this meeting is sponsored by NRAO, the science areas explored are multi-wavelength/messenger, and the science program has strong representation from across the electromagnetic spectrum. We hope to see you in Portland in June! A second round of ngVLA Community Studies was initiated to tackle some of the most pressing questions unveiled by the first round studies. The primary objective for the second round is to further develop the Key Science Goals outlined in Memo #19. Studies and simulations were asked to focus on addressing these key science goals, and better quantifying the expected performance of the array while providing additional supporting technical requirements. The second call yielded 12 approved scientific studies. All accepted Community Studies efforts from this second round are expected to write up their findings as part of a peer-refereed journal article or ngVLA memo, and present their progress/final results at the Astrophysical Frontiers in the next Decade and Beyond conference, 26-29 June 2018 in Portland, Oregon. A Hubble Space Telescope image of MACS1149-JD1with the ALMA [O III] contours overlaid. Astronomers are striving to see the earliest galaxies in our Universe and study how they influenced the intergalactic medium a few hundred million years after the Big Bang. The abundance of star-forming galaxies declines from redshifts of ~ 6-10. A key question is the extent of star formation at earlier times, when the first galaxies emerged. In a recent paper in Nature (reference below), Takuya Hashimoto et al. 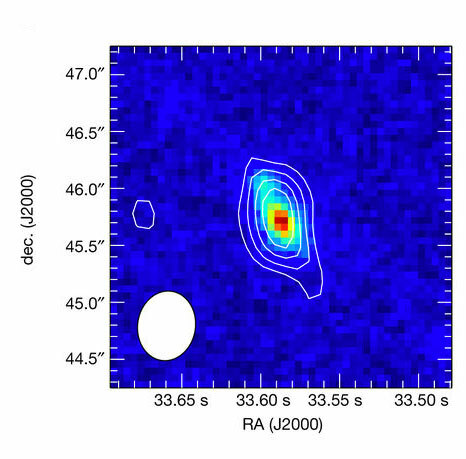 report and analyze Atacama Large Millimeter/submillimeter Array (ALMA) spectroscopic data of MACS1149-JD1, a gravitationally-lensed galaxy observed when the Universe was less than 4% of its current age. The authors securely detect their target, the 88 μm emission line of doubly ionized oxygen, at a redshift of 9.1096 ± 0.0006 to a significance of more than 7σ. The spatial location of this emission is coincident with the rest-frame ultraviolet continuum emission detected by the Hubble Space Telescope and Lyα emission tentatively detected by the Very Large Telescope at the same redshift, indicating that the [O III] line arises from a star-forming galaxy. This precisely determined redshift indicates that the red rest-frame optical color arises from a dominant stellar component that formed ~ 250 million years after the Big Bang, corresponding to a redshift of ~ 15. These results indicate that it may be possible to characterize such early episodes of star formation in similar galaxies with future telescopes. Publication: The onset of star formation 250 million years after the Big Bang, Takuya Hashimoto (Osaka Sangyo University) et al., Nature 557, 392-395 (2018). ALMA Transporter Lore working in a compact antenna configuration. The Call for Cycle 6 proposals closed on 19 April, with a total of 1838 submitted proposals, an 11% increase from the 1661 proposals submitted in Cycle 5. The total time requested for the 12-m array is just short of 19,698 hours, 3670 hours higher than in Cycle 5. This is an oversubscription factor of 4.9 above the 4000 available hours. All regions show an increase in oversubscription in this Cycle. For the 7-m and Total Power arrays, the total time requested is 10,941 hours and 7117 hours, respectively, slightly lower than in Cycle 5. The median amount of 12-m array time being requested per proposal is 8.7 hours, higher compared to earlier cycles. This is double the requested 12-m array time in Cycle 2 for instance. Statistics for the Cycle 6 Call for Proposals are available at the ALMA Science Portal. The array is transitioning to the most compact C43-1 configuration – 3.4 arcsec beam at 100 GHz, 15-161m baselines – in early June. Array elements then move outward in an expanding array cycle in July. Packing 12m antennas to spacings as small as 15m requires careful and accurate antenna placement, with only a few centimeters of clearance, but the massive antenna transporters are guided by GPS, allowing the third-of-a-million-pound transporter plus antenna to maneuver the antenna to its target location, setting it down with millimeter precision (see image). Several periods of excellent weather occurred recently, allowing 64 of the 66 ALMA antennas to collect data in the highest submillimeter wavelength bands. Processed data is currently being delivered within ~ five weeks of acquisition. System Astronomer: The NRAO invites applications for a system astronomer to be part of the Joint ALMA Observatory’s (JAO) Department of Science Operations (DSO). ALMA system astronomers are the experts on the ALMA Observatory and its performance, and provide advice and assistance to ALMA operations. They work closely with the ALMA Regional Centers, the system engineers in the ALMA Department of Engineering, and the staff in the ALMA Department of Computing. 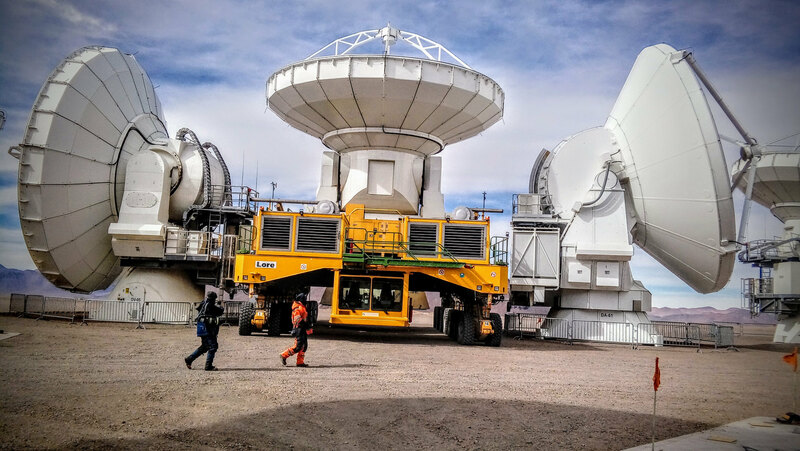 The system astronomers also contribute to science operations as Astronomers On Duty, and participate in tests and evaluation of the ALMA software systems relevant to operations. About this month's photo: Students participating in NRAO summer student programs arrive at their respective NRAO sites in late May and early June. Since its inception in 1959, the summer student program has engaged over 1,000 young people in scientific research, and many NRAO summer students have gone on to distinguished careers in astronomy and other physical sciences. The list of former NRAO summer students includes women and men who represent a wide range of career stages, research interests, geographic locations, and ethnic backgrounds. 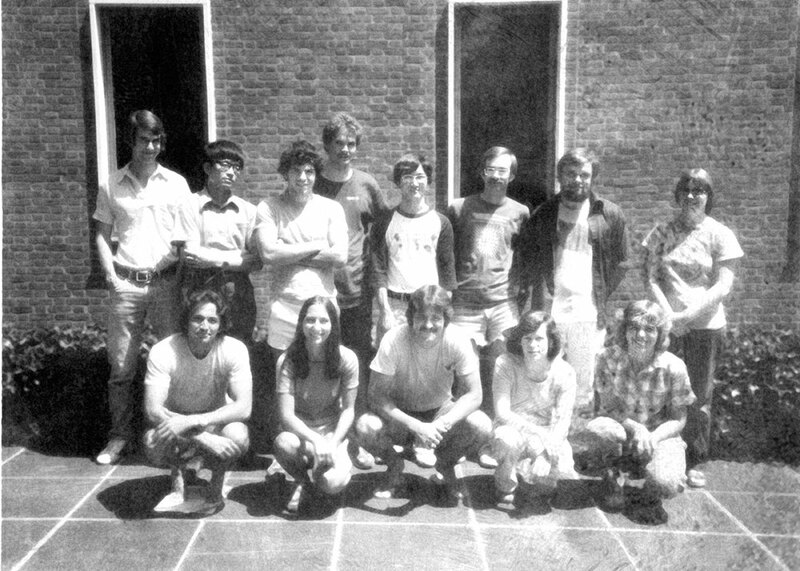 This photo is of the 1981 Charlottesville summer students. [Left to right, top row] Jim Knoke, Chong-An Chang, Dave Wolpert, Tony Davidov, Roy Nakatsuka, Reinhard Skuppin, Debe Crocker. [In front] Paul Coleman, Deanne Tucker, Jim Lewis, Elizabeth Sturgis, Carol Bornmann.